Hugo Olof Von Hofsten was born in Vermland, Sweden, June 20, 1865. His father was a manufacturer in Karlskoga. He came from a Swedish family elevated to the nobility in 1726 and prominent in Swedish commerce, industries, and literature. In Sweden, he studied in Stockholm at the Royal Academy under M.E. Wingé, Olof Arborelius and Hugo Palm. He emigrated to the United States at the age of 20 in 1885. He began life in America as an illustrator in New York, working on the New York Graphic as well as other periodicals. He settled in Chicago, IL, in 1893, working there also as an illustrator on local daily and Sunday newspapers. He also created drawings and paintings, concentrating on landscapes, which he exhibited locally. He was the official artist for the Cook County Forest Preserve and the President of the Forestry Painters Club in Chicago. When the Swedish-American Art Association was established in 1905, Von Hofsten was chosen as treasurer. An exhibit comprised of members of this group was held that same year which included works by Von Hofsten. He exhibited watercolor paintings at the Art Institute of Chicago four times between 1903 and 1917. He was awarded the first watercolor prize by Swedish American Artists in 1919. He was perhaps best known as a book illustrator, drawing pictures for a series of children’s books called the "Pleasant Hour" books, published mostly during the early decades of the 1900s. Titles in this series included Uncle Tom’s Cabin, Little Red Riding Hood, A Christmas Carol, Little Lame Prince, and Black Beauty. He also illustrated a series of books featuring "Billy Whiskers" and the "Mother Goose Jungle" books. He produced the illustrations for the book What Has Sweden Done for the United States, written by Lars P. Nelson, "printed and sold for the benefit of the famine fund for northern Sweden and Finland" in 1903. 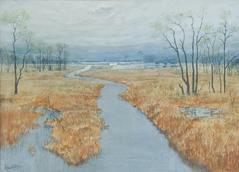 The watercolor landscape (n.d.) by Von Hofsten in the Fine Arts Collection was donated to Luther College by the family of Nils Remmen in 1941. It was added to the Inventory of American Paintings at the National Museum of American Art, Smithsonian Institution. American Painters of Swedish Descent. New York, NY: The American-Scandinavian Foundation, 1920; Olson, Ernst. The Swedish Element in Illinois: Survey of the Past Seven Decades. Chicago, IL: Swedish-American Biographical Association, 1917; Who Was Who in American Art, 1985; 1999.